Providing you the best range of solid fired thermic fluid heater with effective & timely delivery. Thermotech offers complete solution of Thermic Fluid heating system along with Pipeline, Pollution control equipment, fuel handling, etc on Turnkey basis. Solid Fired Thermic Fluid Heater based upon advanced technology is offered by us. Our products are precisely engineered under the stern supervision of experts. We ensure that the products we offer not only comply with the specific norms but also meet the customer’s expectations. One can avail our range in various specifications. Stationary Grate Combustion Technology is best suited for fuels like Wood Waste, Coal, Lignite, Briquettes, etc with manual feeding into furnace. Stationary grate combustion technology with auto feeding is best suited for fuels like Wood chips, briquettes, Agro waste with manual feeding into furnace & paddy husk, saw dust, etc with auto feeding by screw feeder. 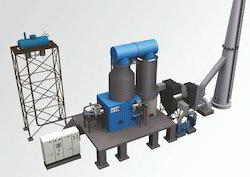 Fluidised bed combustion technology is best suited for fuels like low grade coal, paddy husk. Petcoke, pellets, etc with auto feeding system of over bed & under bed into Furnace.